This is a review game for algebra or geometry students on the properties of simplifying radicals. 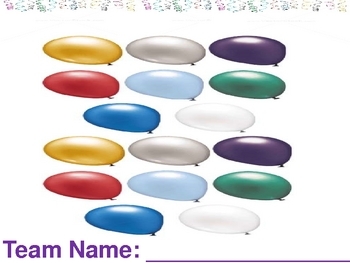 Instructions: Print out balloon sheet (slide 14) for each team of students. Place balloon sheet inside clear page protector. Each team needs a dry erase marker. Each team will write a team name and then hang their sheet on the board. Now each team picks a number. 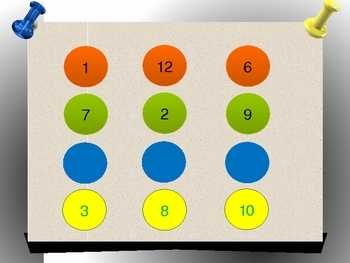 Click the number on the home screen (slide 1) for students to work the problem. Each team must agree on a team answer. If a team gets the correct answer, they may go 'pop' another teams balloon by marking an 'x' through it. As play continues a team's balloons may all be 'popped'. If that team continues to get correct answers, they may 'inflate' a balloon of their own by erasing the 'x'. This is only allowed after ALL of their balloons have been popped. Whichever team has the most 'unpopped' balloons at the end wins. This game hinges on the fact that teams MUST get the correct answer before they are allowed to pop.